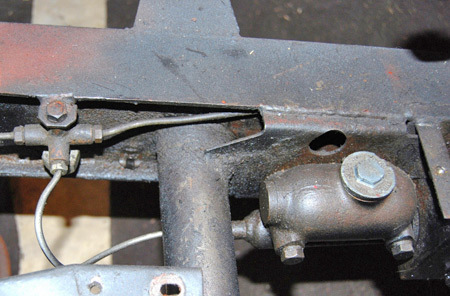 A soft or spongy brake pedal indicates it is time to "rebuild" your master cylinder. You'll have to remove it from the car, disassemble, clean the metal parts, hone the bore, install new parts from a rebuilding kit and reassemble it. On some old cars like this MG TD the master cylinder will be on the frame directly behind the brake pedal. These are a bit hard to get to with the car body on, but some kind of access panel will be found in the floorboard. Master cylinders may have one blind end, threaded end plugs or a piston stop that fits around the push rod and is held by a snap ring. Most have a uniform bore, but some have a "step bore" with different size cylinders at each end. Before rebuilding a master cylinder, check a repair manual for your car and find cutaway drawings that show what your master cylinder looks like inside. You'll see how the parts properly fit together inside. If your master cylinder has threaded plugs, they'll have hex-shaped heads. Use a large wrench to remove them. If the cylinder is rusty, brush off loose rust and apply penetrating oil. Let it sit awhile before attempting to loosen the plug. To remove snap rings, clamp the master cylinder in a soft vise and push the end plug in against spring pressure with a large bar. When the plug is pushed past the locking groove, you can remove the snap ring with needle-nose pliers. Once you have the master cylinder apart, clean all parts with alcohol, Declene or a brake parts cleaner. Inspect the rubber piston cups for swelling. If they show any, it means that oil, gas or some other contaminant has gotten into the brake system. You'll need to flush the system and replace all rubber parts. Inspect the cylinder bore(s) for signs of heavy scoring, rust, pitting or etching. If damage is light, you may be able to recondition it with an inexpensive brake-cylinder hone. These fit into a hand drill and have three legs with grinding stones that expand in the bore. Use the stones (lubricated with brake fluid) to grind off light deterioration. After honing, check that all deterioration is gone. A new or re-sleeved cylinder is preferable to honing. There are numerous companies that restore original master cylinders by sleeving them with stainless steel or brass. If your master cylinder has problems, also check wheel cylinders. Rebuilding kits are available from hobby vendors and online auctions. Check rubber parts carefully. If they have been sitting around for 25-75 years, the rubber may be dry. Brand new master cylinder rebuilding kits are available for many old cars from auto parts stores like Auto Zone. These are freshly made. New Reybestos kit from Brake & Equipment Warehouse in Minneapolis (www.brakeplace.com) contained all parts for '53 Pontiac master cylinder rebuild. Always work clean and layout parts according to shop manual illustrations. 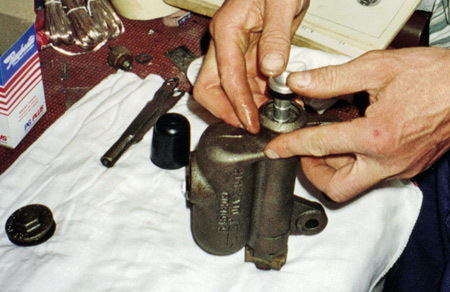 To get a long-lasting repair have the master cylinder lined with stainless steel or brass before putting the parts back in. Brake and Equipment Warehouse (www.brakeplace.com), Apple Hydraulics (www.applehydraulics.com) and White post Restorations (www.whitepost.com) offer these services by mail. 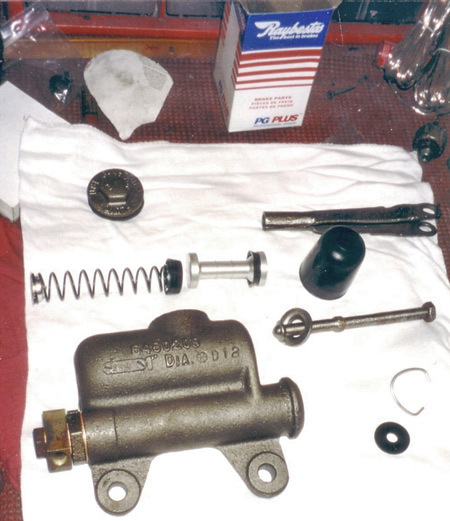 Master cylinder rebuilding kits vary in which parts they include. If your kit does not contain a new piston, carefully examine the old one. If you see any scoring, you'll need to get a new piston or recondition (smooth) the old one with 400-600 grit sandpaper. Be sure to blow off any sanding residue. Rebuilding the master cylinder involves reinstalling all parts in the proper order. It's very important to work clean. Avoid contamination of any type. All parts should be coated with hydraulic brake cylinder assembly fluid or brake fluid. When installing rubber piston cups, don't damage the edges. Usually the check valve fits into the piston return spring and this assembly goes in the bore first. Then, install the first piston cup, with the cupped side towards the spring. The piston goes in against the back of the cup. The end of the piston with the secondary (rubber) cup faces the push rod. The second cups seals around the piston. Thread in the end plug or piston stop or lock it in place with the snap ring. Before you reinstall your master cylinder, fill the reservoir with brake fluid and bench bleed it. Mount the cylinder in a vise and open the filler cap. Run a line from its output port into the reservoir. If the car has a dual braking system, there are two ports and you'll need two bleeder lines. Pump fluid through the bleeder lines by depressing the piston with a wooden rod. This pushes air out of the fluid in the reservoir and makes the brake system easier to bleed later. 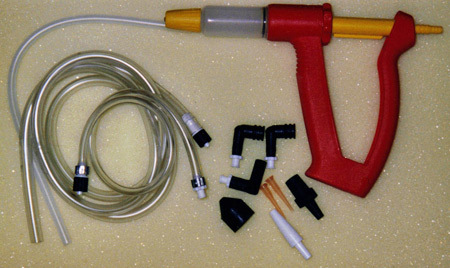 A bleeder tool like this one (www.brakebleeder.com.) comes in handy for bench bleeding the master cylinder before installing it on the car as well as for bleeding lines and wheel cylinders later on.